Bangkok Garden Thai Restaurant, Hackensack, NJ. 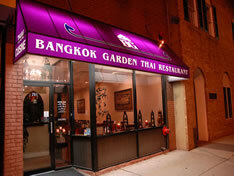 A New Jersey restaurant review of a very reasonably priced Thai restaurant serving good food in a friendly setting. In an area surrounded with many populated communities with Thai restaurants, this restaurant ranks with the best Thai restaurants in the area. The reason you come to this place is for the exceptional Thai food at a very reasonable price. They offer a no frills restaurant in a small storefront setting on Main street with a modest decor. It's a good choice for a small quiet diner with family and friends. The food at Bangkok Garden is well prepared with fresh ingredients. The staff is very friendly and knowledgeable, and if you are unsure about the menu, ask the staff for suggestions, they are good at helping you decide. For starters, try the Bangkok Combination with Bangkok Goong Ka-Borg, Fried Wonton, Fried Kha-Nom Jeeb and Thai Egg Roll served with plum sauce; For a less expensive starter, try the Thai Egg Roll with ground breast of chicken, shredded bamboo shoot, bean thread noodle and egg wrapped in spring roll skin, deep-fried, served with plum sauce. For Dinner entrees, try the Gang Ped, Red Curry) with a choice of chicken or beef sauteed with red curry, coconut milk, bamboo shoot, basil and kaffir-lime leave; or the Bangkok Seafood with stir fried shrimp, sea scallop, squid, mussel and jumbo lump crabmeat with red curry paste, fresh chili, red bell pepper, fresh basil and kefir-lime;or the more expensive Pla Rard Prig (fish with spicy sauce) The most famous Thai fish dish. A whole fish deep-fried topped with chili pepper and garlic sauce. There is metered street parking and you can easily find a parking spot in front. They also serve a good selection of mixed drinks, including, teas, beer and wines. Desserts are worth saving room for.